India is a land of festivals and Indians remain busy through out the year celebrating festivals one after the other. There are regional festival that are confined to a particular region while there are festivals that are celebrated across the country. Dussehra Navaratri - the 9 continuous days (nights) festival and Vijaya Dasami - the 10th day are considered highly auspicious and celebrated across the country with much devotion and fervor and festivity. The festival symbolizes victory of good over evil. People start their new ventures on Vijaya Dasami day as it is believed that starting new venture on this day brings great success. Dussehra celebrations differ from one region to the other. During the festival, Goddess Durga is worshiped across the country.Each region / state of India celebrates the festival according to its custom in a traditional way. The festival celebrations of some regions have become famous across the country while the celebrations in some other regions are in the usual manner. A majority of the people of West Bengal are followers of Shakti cult. The 8th day during the Dussehra Navatri is the most important day for Bengalis and is celebrated as Durga Puja. The Durga Puja celebrations in West Bengal is the most popular one in the country. Bengalis across the world worship Durga Devi with much fervor and high spirits. Bengalis celebrate the festival as Durga Puja with great fervor and enthusiasm. Beautifully and colorfully decorated idols of Goddess Durga Devi are installed in community pandals / centres and worshiped in the most traditional way with devotion. People irrespective of all age groups and gender participate in community feasts, cultural events and dance to the rhythmic drum beats and with ecstatic screams / shouts like "Olololoooooo" and the blowing of conch producing maximum sound. The clay idols are ceremoniously immersed in water sources on the 11th day. In the other Eastern states too Durga Puja is celebrated in a similar way as is celebrated in West Bengal. Dasara known as 'Nadahabba' is the state festival of Karnataka. Dasara celebrations of Mysore are worth watching. It is celebrated in a unique way with the spectacular grand and gala procession of the Royal family on the heavily bedecked elephants on the 10th day i.e on Vijaya Dasami day. The procession starts from Mysore Maharaja Palace, taken along highly illuminated streets of the city and ends at Bannimantap. Many cultural programmes, various sport events, fairs, exhibitions are held during Dasara and the palace area echoes with typical festive fervor. The festival is witnessed by tourists across the country. At Tirumala - the abode of Lord Venkateswara - the annual Srivari Brahmotsavam is celebrated during Dussehra Navaratri. Devotees from acrosuks the world visit Tirumala to witness the festive celebrations and are blessed. Tirumala is the temple town on the uphill of Tirupati in the Chittoor district of Andhra Pradesh. Besides the grand celebrations of Srivari Brahmotsavam, the people of Andhra Pradesh celebrate the festival in different ways in different regions of the state. In some regions the young girls showcase their talent of displaying their dolls in an array which is known as Bommala Koluvu. The culture of Bommala Koluvu during Dussehra Navaratri by the Telugu people is assimilated from Tamil Nadu which is known as 'Golu' in Tamil. Friends, relatives and neighbors are invited to see the Bommala Koluvu. Dussehra is celebrated as Sharad Navaratrulu at Vijayawada Kanaka Durga temple in Andhra Pradesh. Goddess Durga is specially dressed in different alankaras / forms on each day of Sharad Navaratrulu (9 days). The temple is heavily crowded with devotees from across the state and neighboring states. In Telangana, Dussehra is celebrated in a unique and colorful way. 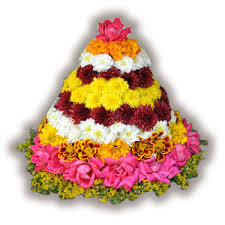 The entire state is decorated with colorful cone-shaped floral Bathukamma. The women folk make beautiful and colorful Bathukamma, place a small idol of Goddess Durga on top of Bathukamma and worship Her. On the 8th day i.e on Durgashtami day, the women carry these Bathukamma placed on their heads and immerse these in the nearby water sources. The Dandia dance / Ras Garba / Garba dance of Gujarat is the highlight of Dussehra festival. The people of Gujarat, particularly the women folk, dress in colorful traditional attire and involve themselves in Dandia dance (rhythmic beating of bamboo sticks held in hands) or the Ras Garba dance popularly known as Garba dance and is the main attraction of the festival celebration. Besides worship of Goddess Durga, the people of the state worship Dussehra in a unique way. They worship the Shami tree (Aapta tree) on this day and exchange the leaves of the tree which is considered auspicious. Such an exchange of Shami leaves mostly with the neighboring villages crossing the borders is known as Seemolanghan. During their 12 years exile period, Pandava prince Arjuna stored his arms and ammunition on the branch of Shami tree. Ramlila celebrations in the Ramlila Maidan (grounds) of Delhi is one of the most popular celebrations during Dussehra. In Delhi and other North Indian states, people make huge effigies of Ravana - the King of Sri Lanka, his son Meghanath and his younger brother Kumbhkarna. People are involved in different events like enacting the scenes of Ramayana. They go his crowded procession and on the Vijaya Dasami day, the huge effigies are burnt to ashes. Dussehra Date - Navaratri begins from Oct 11, 2018 (Thursday).